Notable for its open weave design available in rich Carmel or Bisque finishes, this motion-based lounge chair fuses traditional patio aesthetics with modern outdoor performance. The swivel glider was crafted from Lloyd Flanders' innovative SunLoom vinyl, which has the appearance of natural loomed wicker but offers increased durability. 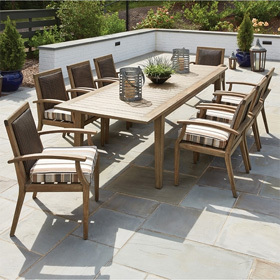 Featuring deluxe cushioning and allowing for both rocking and side to side movement, the chair is perfect for backyard lounges and conversation areas.